Going Green is more than recycling empty soda cans. We have been "upcycling" for years in other ways but did not realize it. 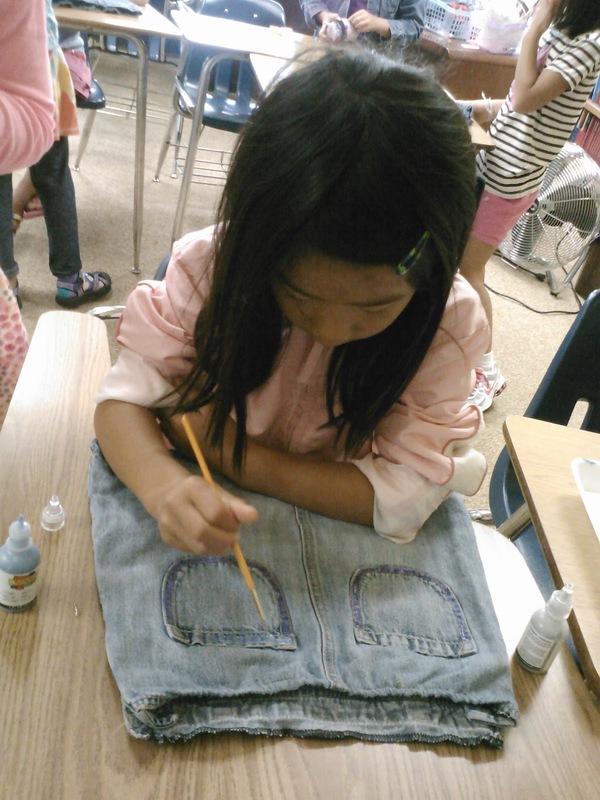 Exploring ideas on using something old to create something new. With the high cost of fabric,taking a thrift store find to a new level is financially and environmentally appropriate. 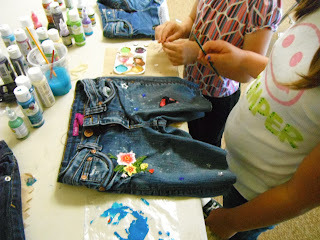 Plus it's so much fun to create! 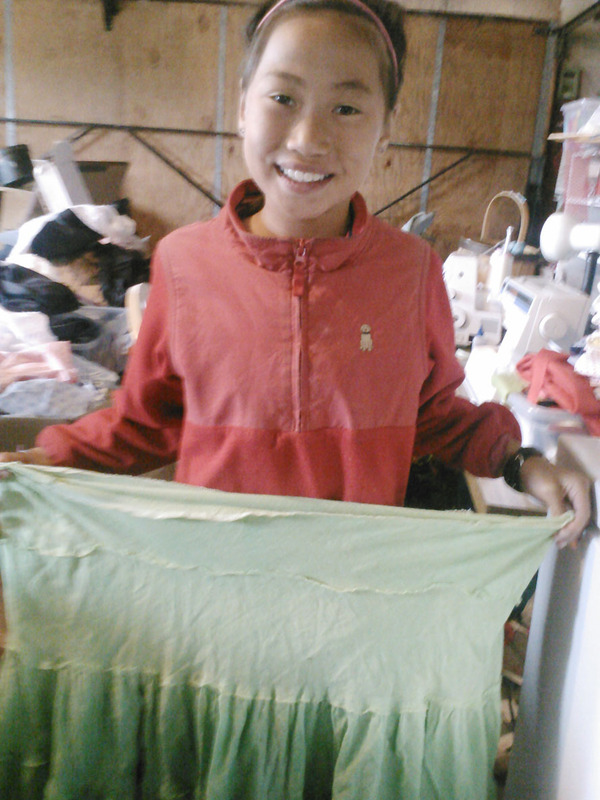 We think of ourselves as saving the planet, one skirt at a time! All supplies will be provided for students. Where is there a Good Samaritin? Ever had one of those days? You know the type I mean where things are going great and BAM!! You are blindsided by a Series of Unfortunate Events. Today had a bit of that in it, way too much for my taste but I have survived to write about it. 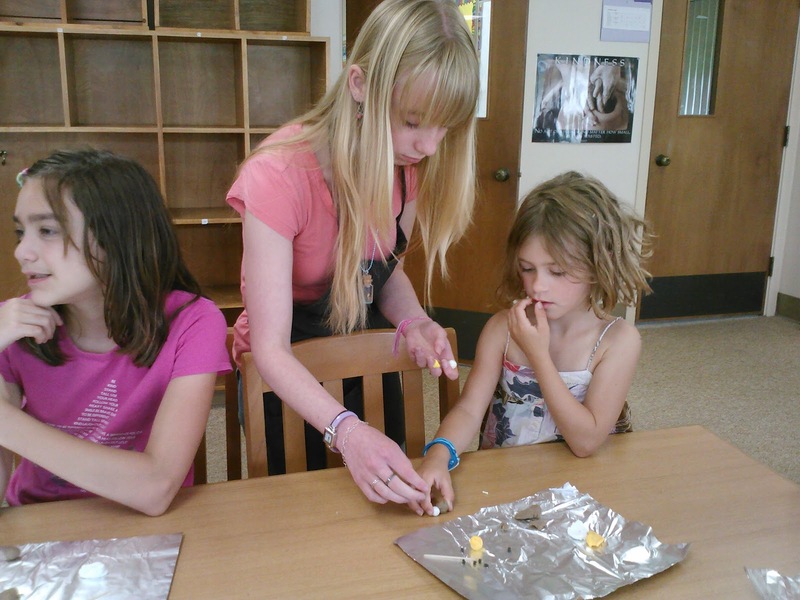 First of all, Audrey had left the oven on all night after she was baking the clay food creations from our students at All Saints School's Summer Fun in the Sun Day Camp. So when I got up and found it on but the stuff was not even baked...well I got a bit irritated. Next, someone left no hot water for my shower so Gggrrrrrrrrrrrrrrr! Than my check engine light came on in my car and I need to get a smog check this month so I knew I was going to have to deal with that this week also. However, a nice trip to Coffee Mia in Marina before going in to teach class helped me so much. Horace makes the absolute best breakfast panini's in the Known Universe. Plus a cheerful good morning from Horace and his lovely daughter could turn any soul's mood around. Class was busy today, with the 8 girls needing to stay very focused in order to get all their projects ready for the last day of camp's Show and Tell program. 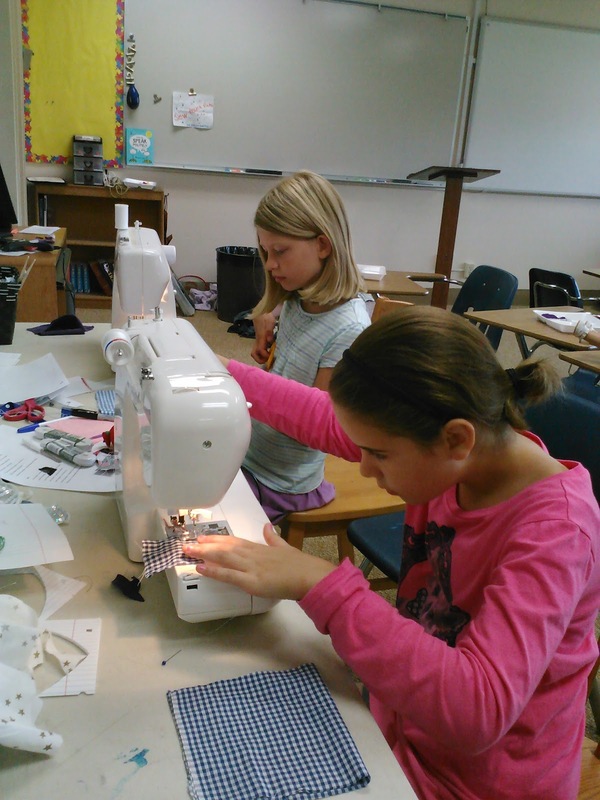 Teaching 8 girls ages 6-9 to sew skirts for themselves and their American Girl Dolls has been challenging this week. But I think it will be worth it. They are all so excited to work each day and we have been able to do several projects each day. Our biggest problem is lost needles. 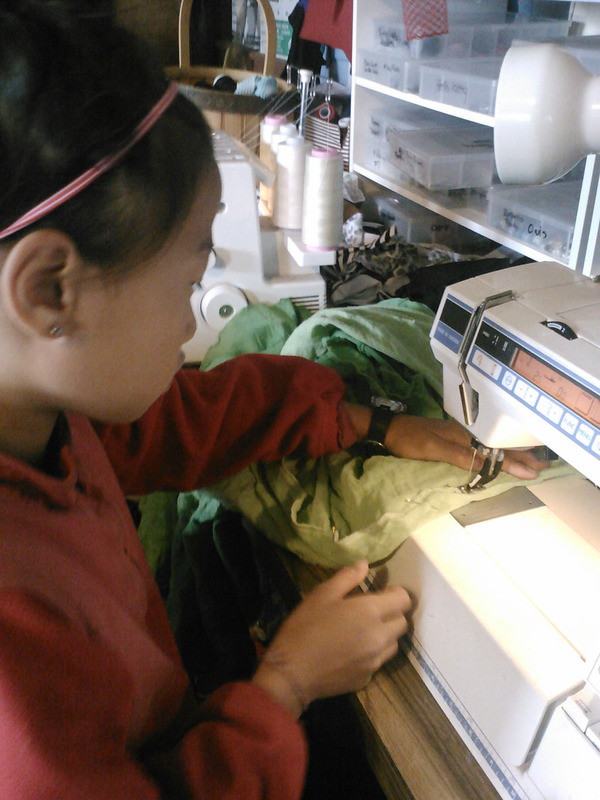 Each week we assign a hand sewing needle to each student and ask her to keep track of it all week. 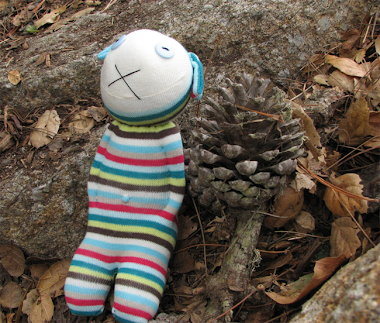 Usually one or maybe two go astray and we search and search until they are found. But this week, we not only lost most of the original eight needles but the entire package of spare needles was emptied out and we could only find about half of them. One nice mom came in this morning and searched around until she found two for us. I can't stand needles to be lost because if you ever are the person that "finds" it with your barefeet, it is not a fun event. 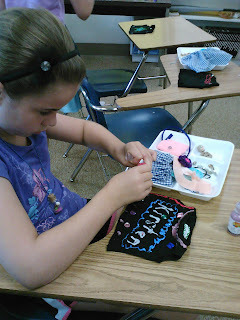 Tiny felt purses with a "bead button" closure were sewing by hand and a cute ribbon was attached for a strap. 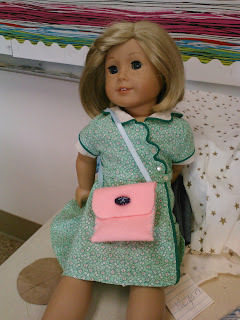 These are two of the girls dolls with their little purses that the girls made themselves. Audrey taught this section of class all on her own . 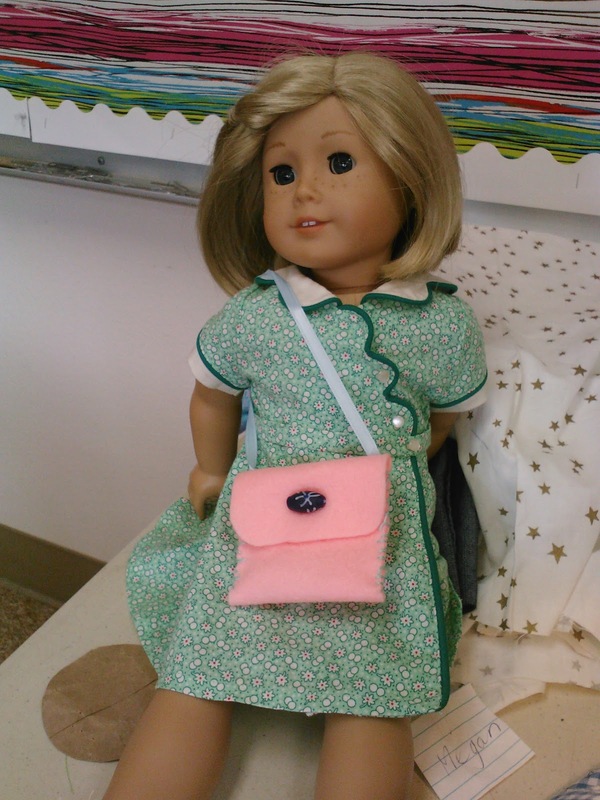 The doll on the bottom photo is also wearing her skirt made by the student, although it is not hemmed yet. 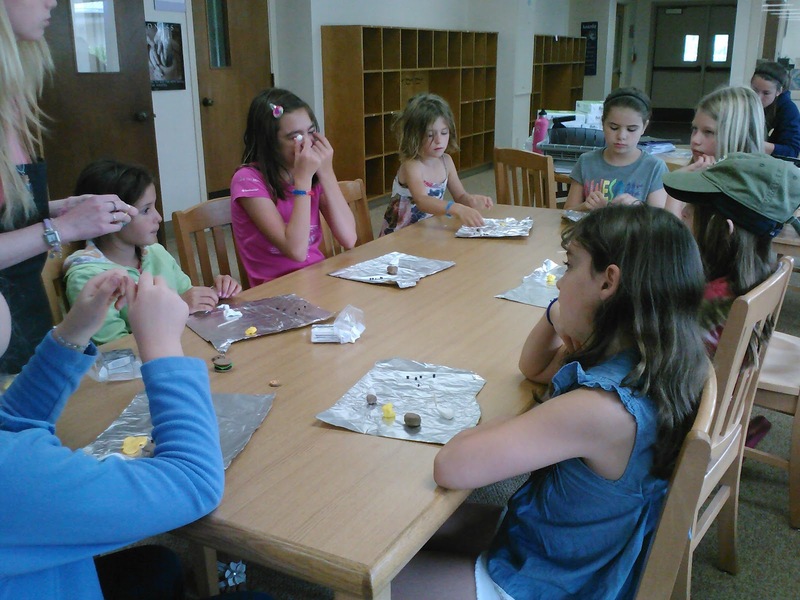 The next venture into making clay food was another project that I left Audrey to teach while I stayed close to supervise the handing out of clay, help mix colors,etc...She is much more artistic than I am so it suits her to work with them on this kind of project. Part of the instructions included creating a tiny object to go inside a little 8mm size glass bottle with a cork and to make the same item much bigger to go into the girls 24mm size matching bottle.This is super fun for the girls because those miniature doll sized bottles had to be ordered from China and are not something they can just go buy locally. This was a special project. 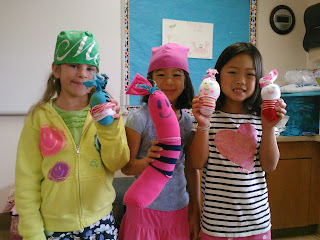 These creations were added to the bottles along with micro-beads and glitter. A tiny eye screw was put into the cork and the bottles were hung from colored ball chain necklaces. 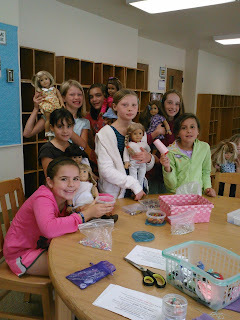 We even found tiny 1mm sized ball chains for the dolls while the girls had the traditional 3mm size ball chains. 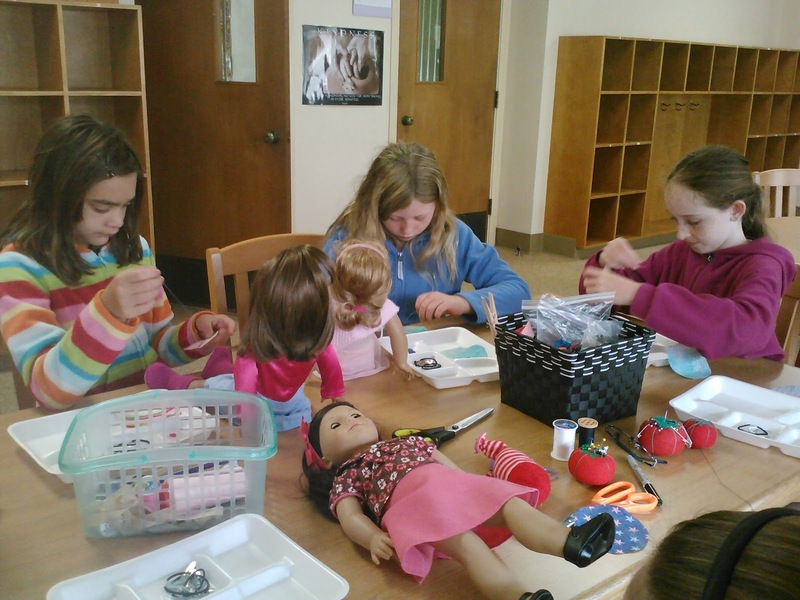 It is so much fun to make the doll and girl stuff that matches. 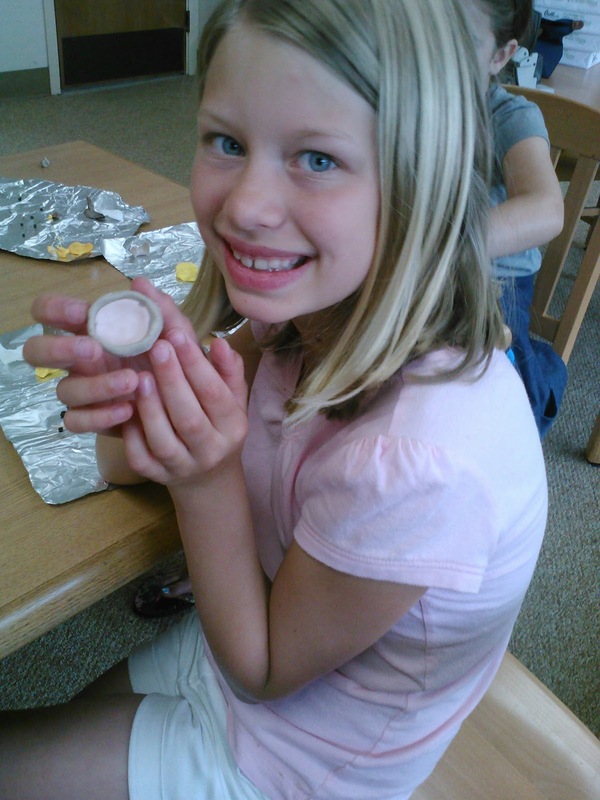 Students worked on tiny fruit tarts and even had little fimo clay fruit slices to add after the pink raspberry filling was created. 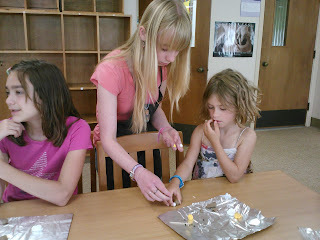 Audrey taught the girls her technique for fluting the edges of the pastry shell. 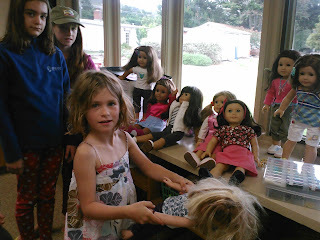 All the girls also had a chance to make hamburgers, potato chips and a chocolate chip cookie for their doll's picnic food. We pre-baked the clay chocolate chips and they are mixed into the cookie dough and textured with a toothbrush. 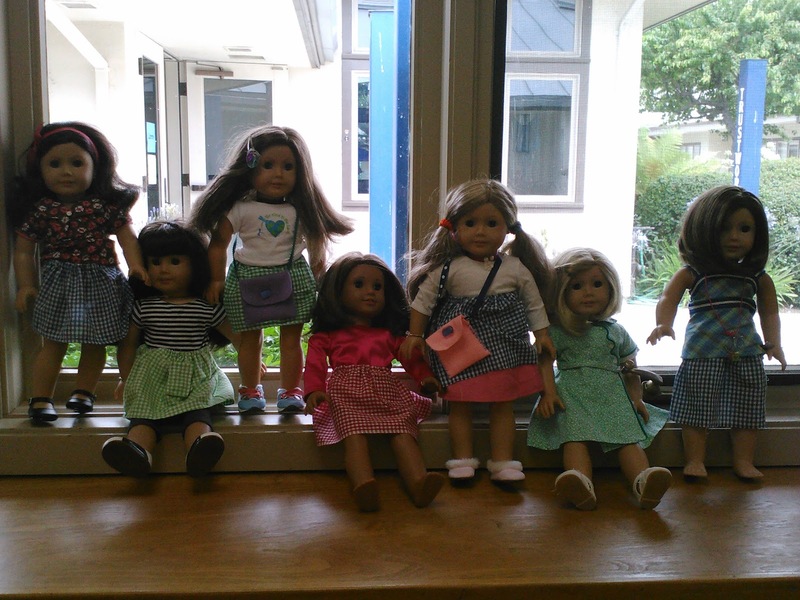 Some of the students set up their dolls for a few photos. 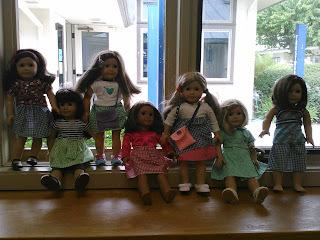 Those dolls were hamming it up for the camera, all hoping to be in this blog so that every could see them on the Internet. I love the group shot they took although the window light made it a bit dark. Work on the skirts continued in the classroom, two students at a time usually. Here, I am shown working with the very first girl to make her own skirt. She did really well and it got everyone else motivated to focus so they could have their turn making their own skirt next. 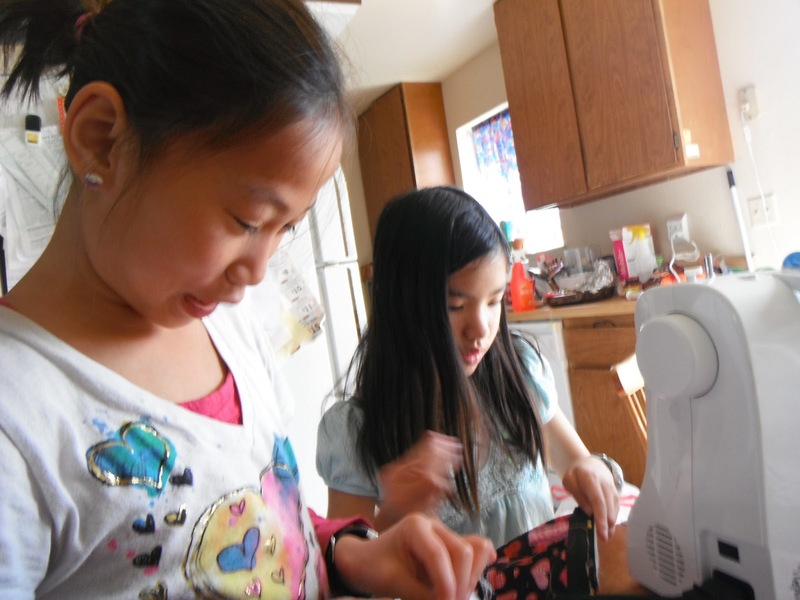 Working on the sewing machines is really so incredible to watch with these young seamstresses. These girls are 6-9 years old yet they sew away like pros after only a few hours of instruction. No fear at all of the machine in front of them. 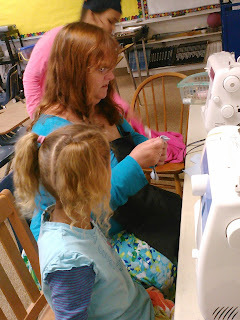 They even enjoy learning about the parts of the machine and how it works to create the stitches. I had stayed up last night until quite late making little knit doll tank tops for all the girls to decorate for their dolls wardrobe. The time put in to it paid off for me today when I saw how happy the girls were to decorate them for their dolls. Here a couple of the examples. Love this cute turtle on this one! Another photo of two of the dolls taken by the girls. 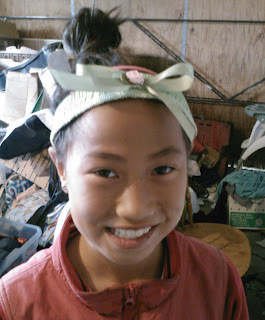 So after a very busy day of sewing with the girls, decorating with paint, finishing the clay projects and also their headbands and purses, we headed out to the car to leave. THE BATTERY WAS DEAD!!! I really don't know how but my lights were on and I sure don't remember turning them on this sunshine bright morning but there we were and AAA said it would be up to four hours for anyone to get to us in the Valley. So I went searching for someone inside the school to help us get a jump start since I had cables but no one was willing to help us. I was feeling really frustrated and reminded of a time that I was stuck in Salinas with a newborn Audrey with a dead battery at the McDonald's and no one would give us a jump that morning either. I had to have my husband come from an hour away to save us because after asking about 20 people, not one was willing to help a stranded mother and her four children get her car started. 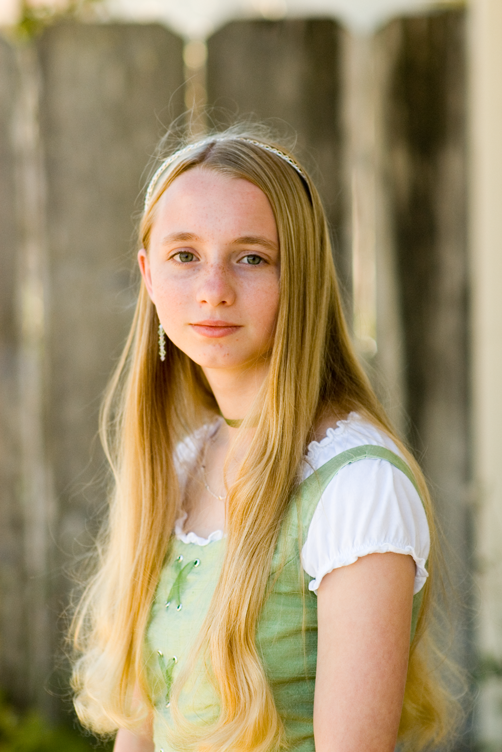 But Audrey spotted an angel in a big SUV, about the leave the parking lot and asked her for help. This wonderful lady was very willing to lend a hand but she was driving her employer's car and had no idea how to pop the hood. Pretty soon one of her friends came over, but she could not find the lever for the hood. I could not find it and neither could Audrey. The car had tons of fancy little buttons but not one did any hood work. Not to give up, while searching for a manual on the car, I tried to call my son Lane who is a mechanic but he was at work and did not answer. Figures huh? Pay thousands of dollars to put him through school and my car is always in need of repairs. But out of the sunny horizon came a big handsome man in a dark blue uniform. "Ladies" he said with a smile, "Looks like you need a bit of help" and after a brief explanation and some magic from "Big Earl", he found the means to get the hood open, helped us with the cables and got my car started. What an Angel!!! Not to mention the two sweet women who stepped in to help us. I decided to count my blessings instead of feeling upset at the loss of an hours time. There are some really good people out there that help others. Before the kind woman left, I gave her my card and told her if she ever needs some sewing done to please call me because I really owed her one. She told me that she really believes in helping others and that God gives us these chances to make someone else's life better. She told me to do something nice for someone else and pass it on instead. The rest of my day did indeed go better and I felt like the blessings heaped on me were the reason. I will watch for future opportunities to keep the Spirit of Kindness in my heart and help someone else the way I was helped today. Maybe this means we will find all the lost needles in our classroom tomorrow! Week three of our awesome Summer Fun at All Saints' in Carmel has started with some wonderful new students and one repeat who is as cute as they come. This week's class is themed "An American Girl Picnic". 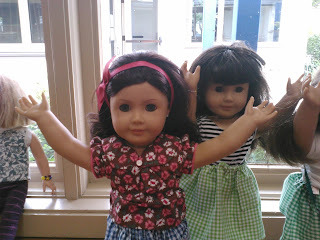 Watch for photos of our doll and girl sized matching skirts as we sew throughout the week. 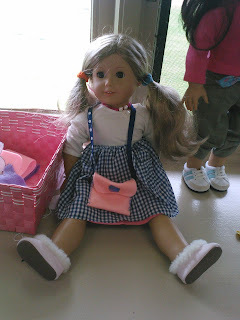 The doll skirt pattern instructions will be posted later. 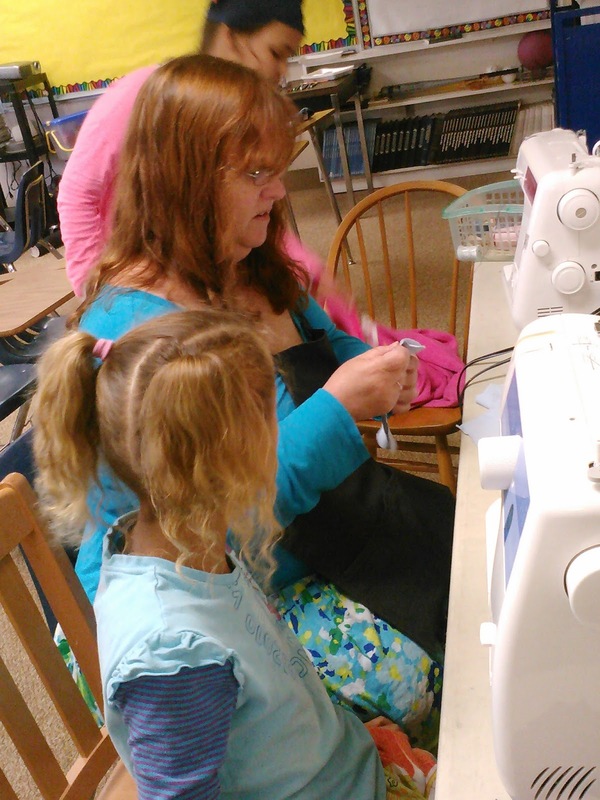 Audrey works with a student on using the running stitch to sew around her circle for a flower to use on a hair clip. 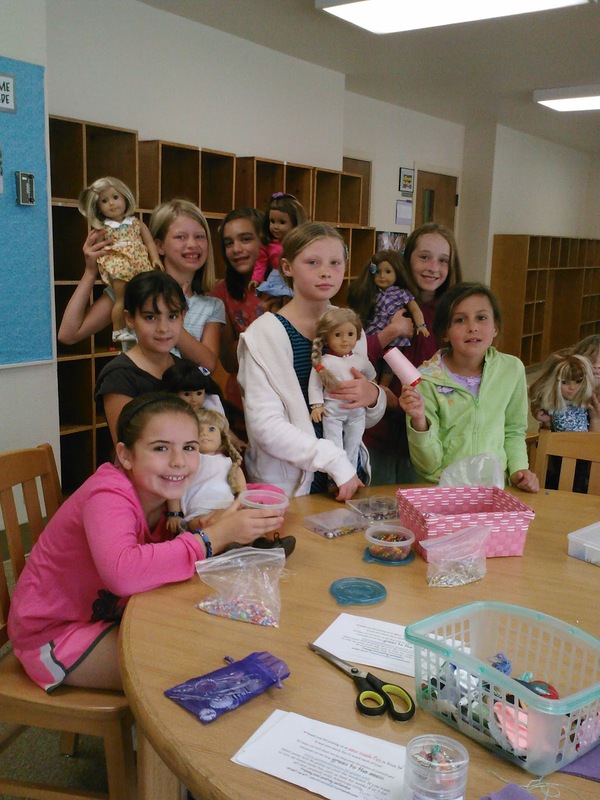 Later in class, the girls were able to make a matching set for their doll and themselves. Our class is pretty mature this week and so we are moving along very quickly. I felt so good after the first day that I knew we could manage to make skirt sets for the girls and their dolls this week even with 8 students and only 15 hours of time together. I am so impressed with their attention to details and wonderful manners. All the parents would be so proud. 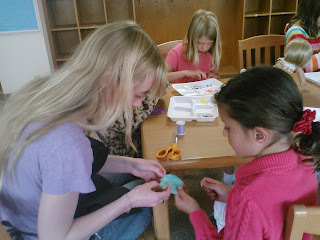 These girls are working on the flowers for the hair barrettes. I love seeing the American Girl dolls all around and hearing the different stories of how each girl got her doll. The concentration on this beautiful students face while working on her first sewing machine project was so adorable that I had to snap a picture of her. She is so serious. 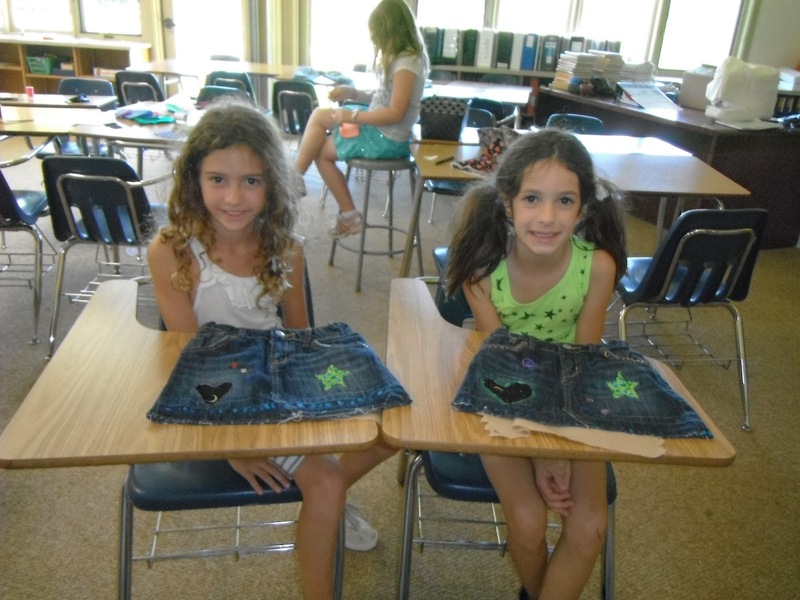 These students on Day 2 are working on their doll skirts. 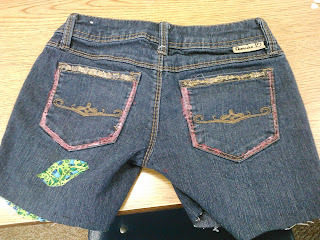 We made a small lined pocket for each doll skirt today. This is a pretty advance task because it is so little but they did a wonderful job. Modeling her flowered hair creations! 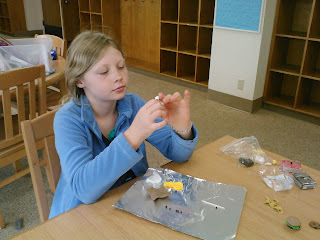 Teaching all week has kept us very busy. 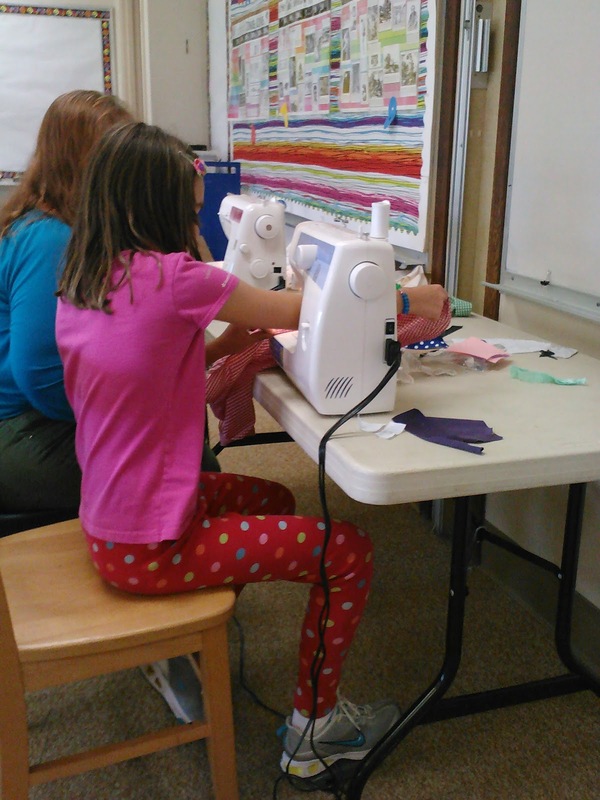 Audrey and I just love teaching these young girls to sew.If you are a parent or seamstress looking for ideas for your young children, keep up with us on this blog for some proven ideas that have worked. Share our successes....and the ones that failed too! This past week we had nine girls in our "Sew Much Fun" class. 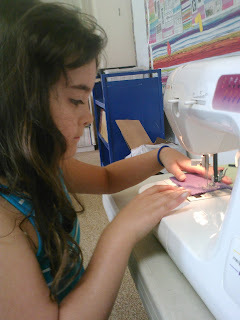 I learned that the more sewing machines is not the better choice very quickly. With just two machines, I could sit here in the middle between two girls on machines and keep an eye on both of them easily. When we had more machines, I had to run back and forth and we had so many jam ups, broken parts and frustration that one machine (after having had the belt broken) and another after having the lever broken ( which I did manage to repair on my own and I am proud of that btw) were both retired for the rest of the week. 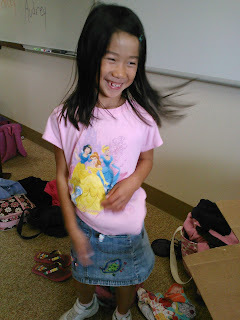 While I am helping one student, this little cutie was hamming it up for a photo op. 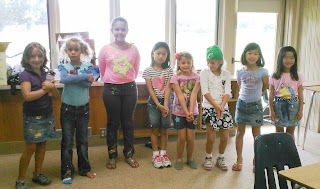 I let the students take turn getting pictures of each other. This one below is probably my favorite goofy picture of the week. Notice they are wearing their awesome hats made from up-cycled t-shirts. 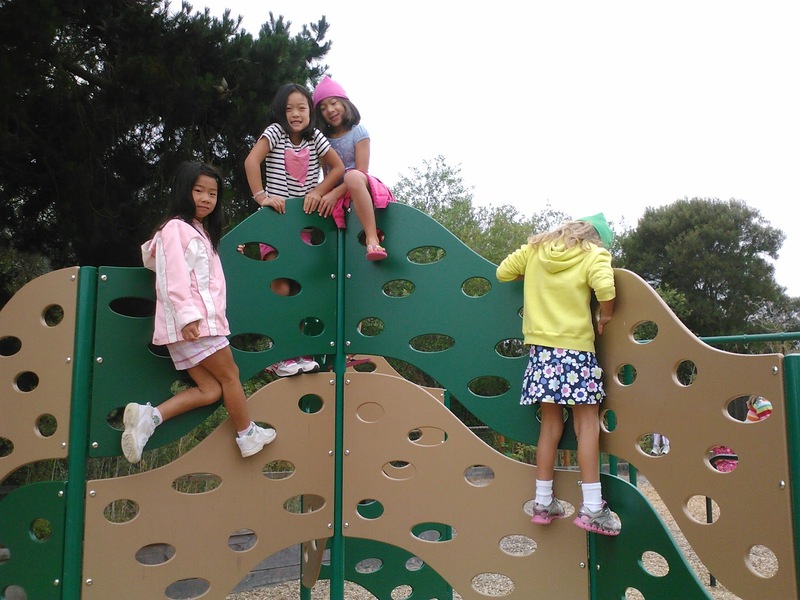 Playground time is important. 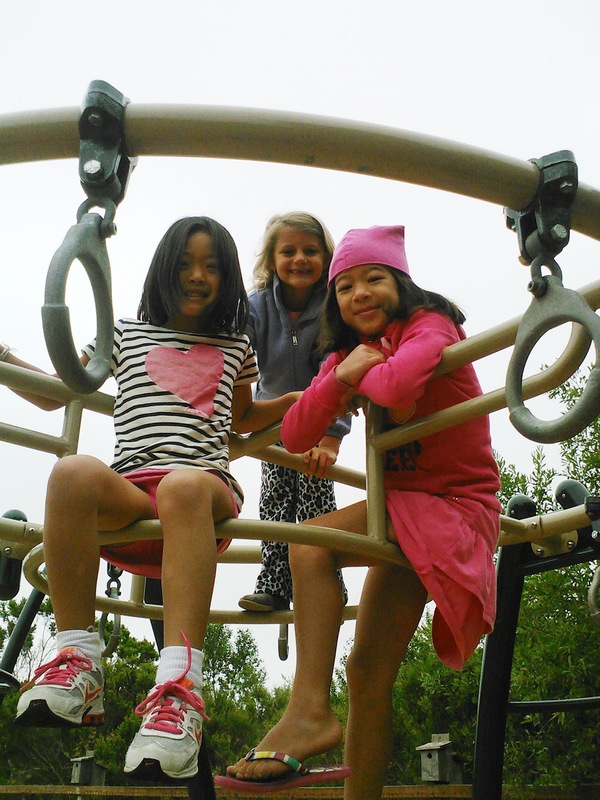 I don't mind having yard duty because I get to interact with the girls out of the classroom for a big and learn more about them. I love how fast they make friends each week. I also noticed that my class always seems to stick together at recess. Decorating and sewing on our denim (and one t-shirt) garments was extremely fun with this exhuberant group. 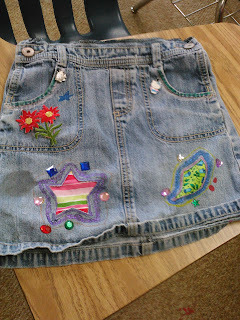 We had a combo of jeans, shorts, skirts and one overall skirt. 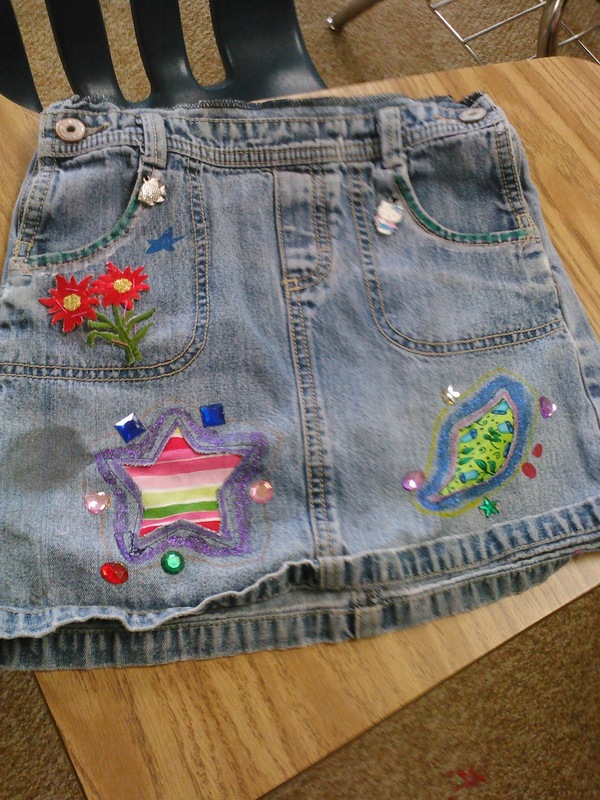 This was the most interesting one because it was an overall skirt that was too small for the child so it involved a bigger challenge. She was not very excited about it because in her mind, this was a baby outfit that she grew out of in pre-school so why would she want to wear it again. 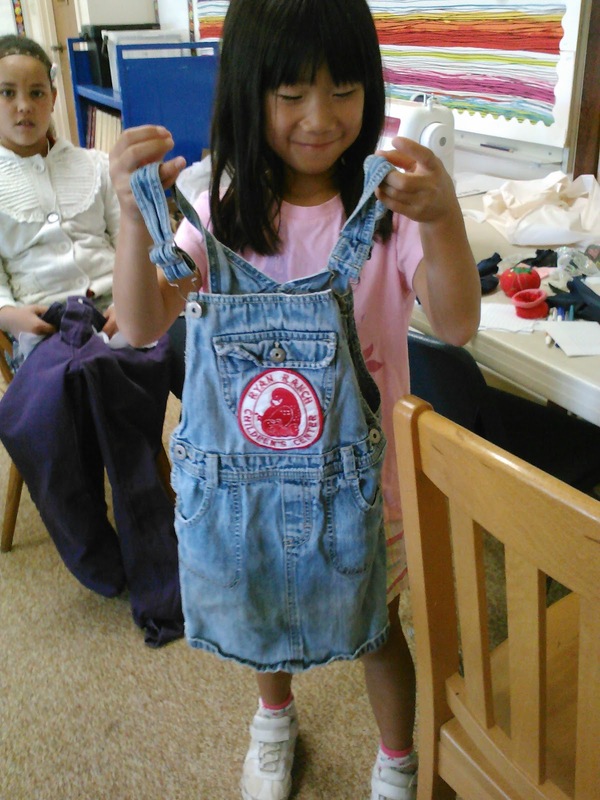 As you can see, our darling little seamstress is holding up her old daycare uniform and it is inches too small. But we checked and it would fit around her still as a skirt. 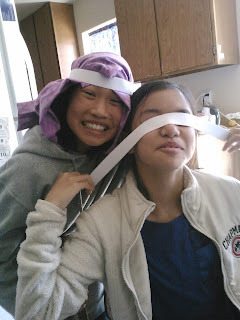 So first thing we did was to cut off the bib part. 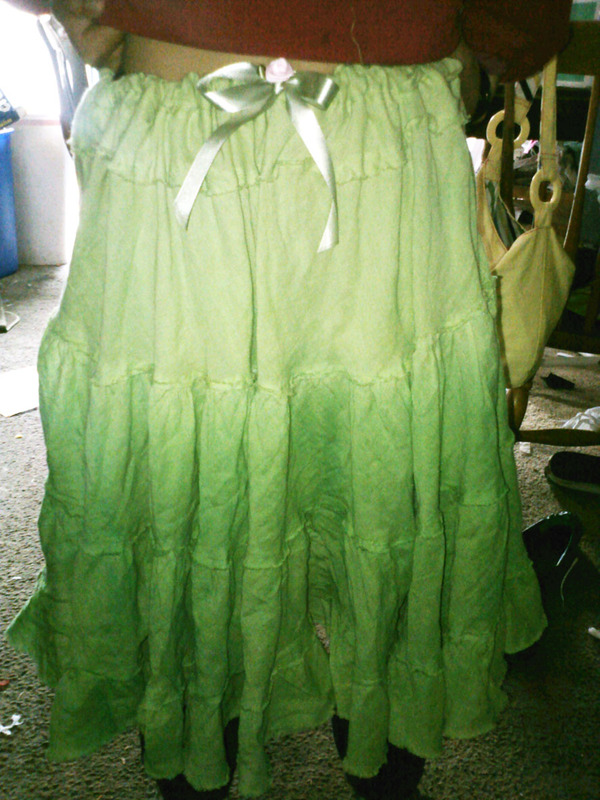 I took the "skirt" portion home and serged it off around the top for her. 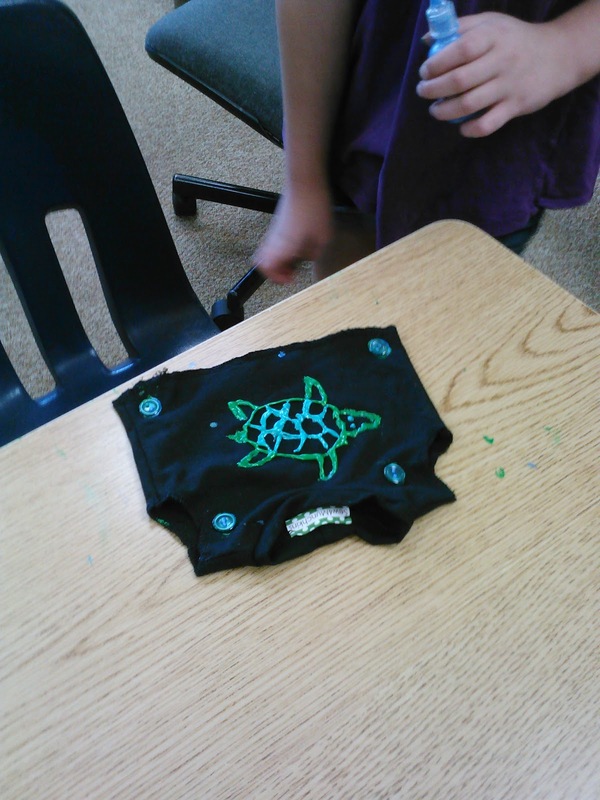 She folded it down and we added elastic at the back for a better fit. The side buttons were still useful so those were left. 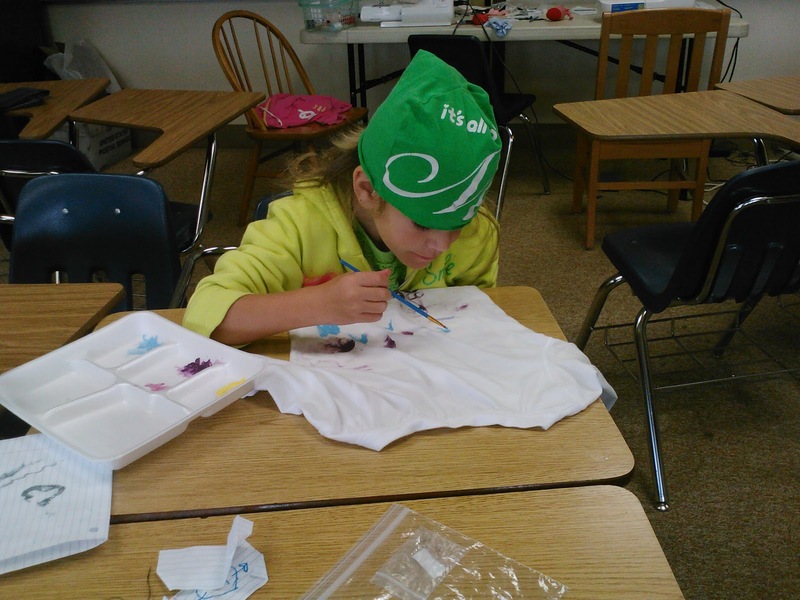 She worked hard at the painting part, both front and back. 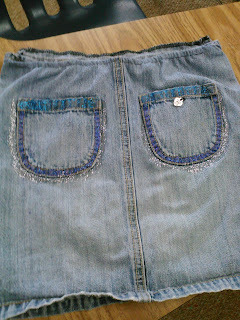 The serged back waistband with elastic is shown here. My cute student put two hand stitched appliques on front along with some gems, a flower applique that was purchased at the store, charms, decorative paint and glitter gel. For added interest, a Hello Kitty Charm by the pocket. After the patches were hand sewn on the back behind the star and leaf, I helped the students sew the inverted appliques on top of their patches and cut out only the top portion. Another cute charm is attached on the back pocket and she painted around each pocket with glitter gel paints. 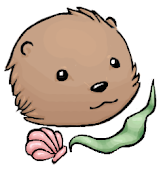 It turned out really cute. 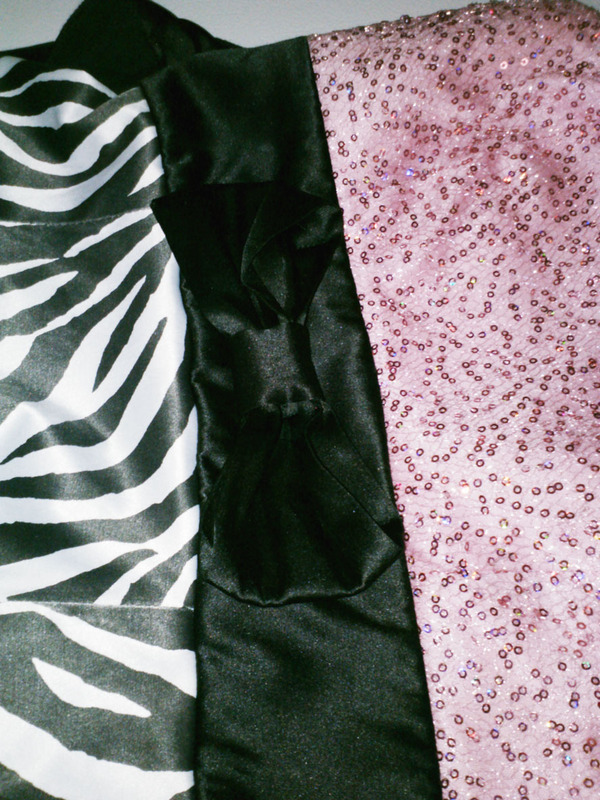 We also added a ribbon belt, which can be seen in the first photo in the blog on the far right. 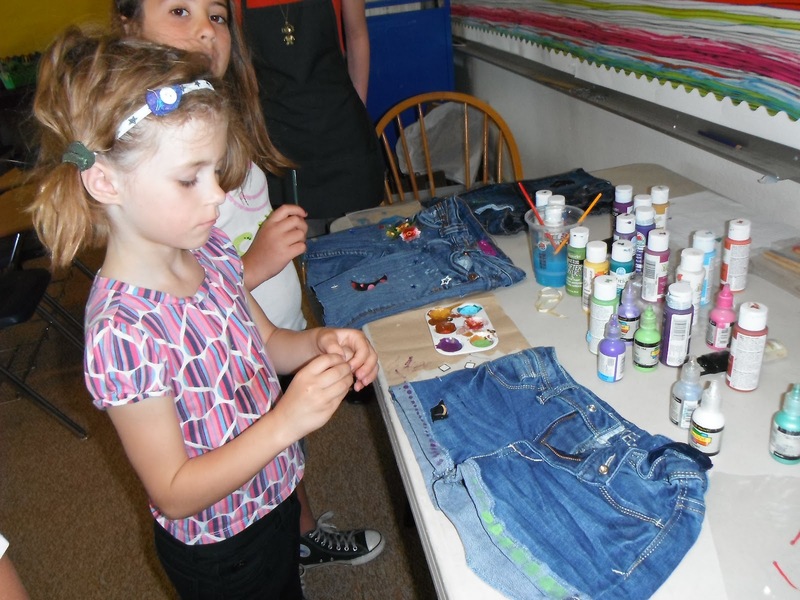 Her grandparents came to the Show and Tell Program and really loved her creation. Great concentration while working, it helps to wear her new beanie hat that she made in class. These shorts were so cute! I would wear them myself. 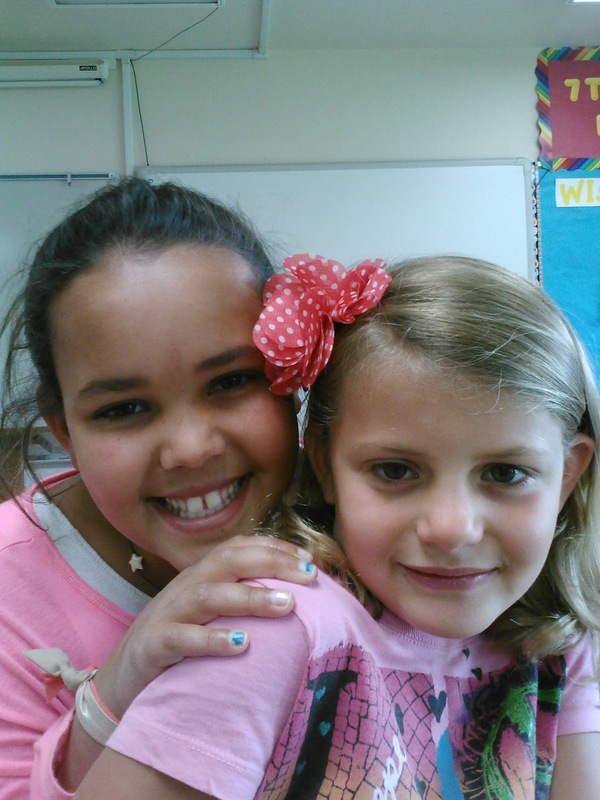 The best part of a week at camp is making new friends! 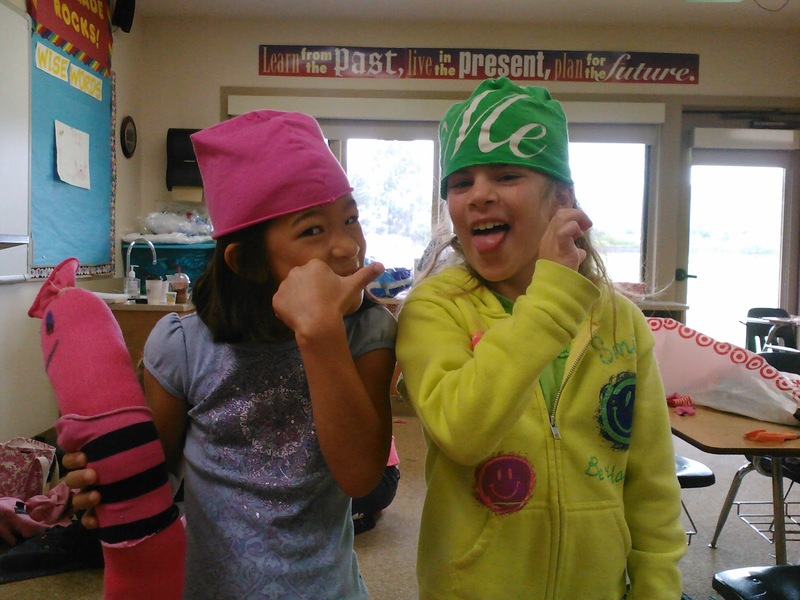 We LOVE Goodwill in Marina, California. 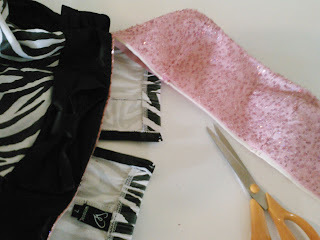 Today's blog with my long time friend and fellow seamstress, Miss Kitty shows two skirts created from her latest discoveries at the store in Marina. First item of business was to figure out how to cut down these huge Adult sized garments to fit her tiny frame. Miss Kitty was quick to get the measuring tape and help out. 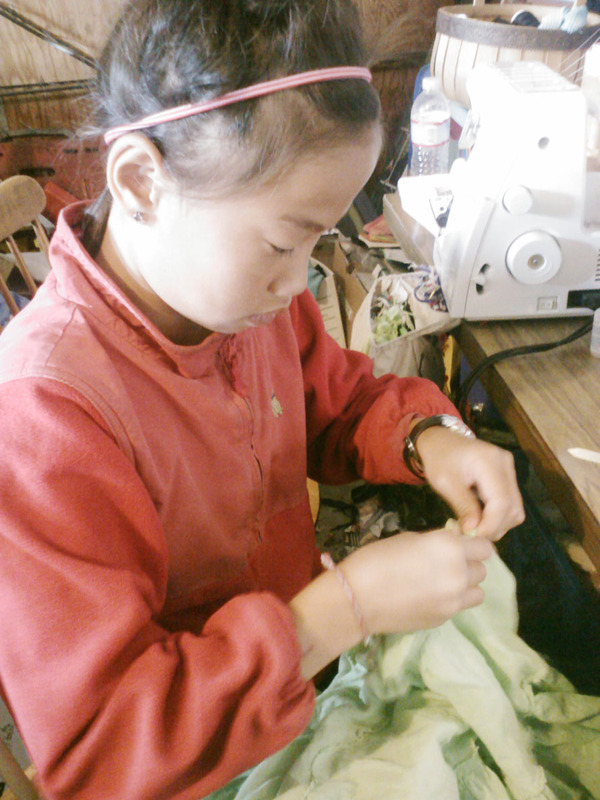 Sewing with my young students is always a joy because of their enthusiasm. Kitty was not lacking any today. I think she was as happy to see me as I was to see her. 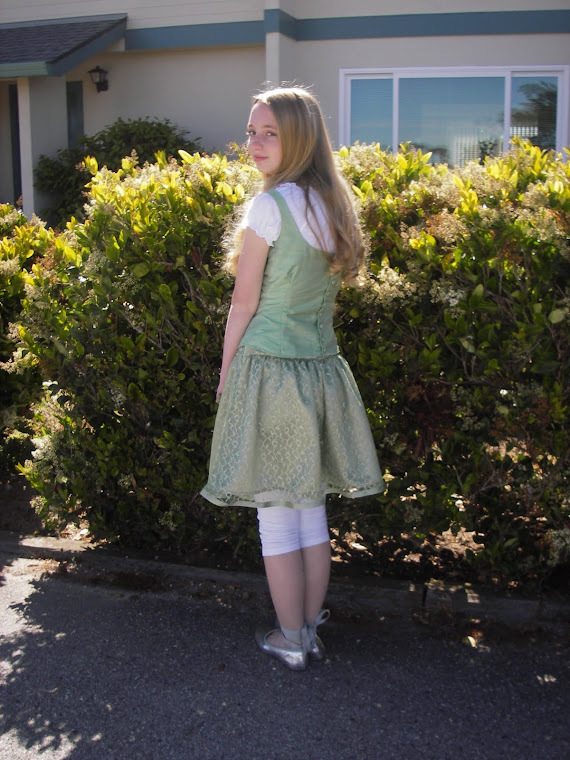 A wonderful green Ombre dyed skirt was a perfect item to re-make smaller for her. It started as a size Large for Adults. As you can see, it is a bit too wide for her. But she loved the twirly ruffles and faded colors from light to dark on the gauze fabric. We almost could have made two skirts for her with it. We cut off the elastic waistband and set it aside for some other use. The top was now open and Miss Kitty decided that she wanted the full fluffy skirt so it was easy to serge the two layers together at the top. 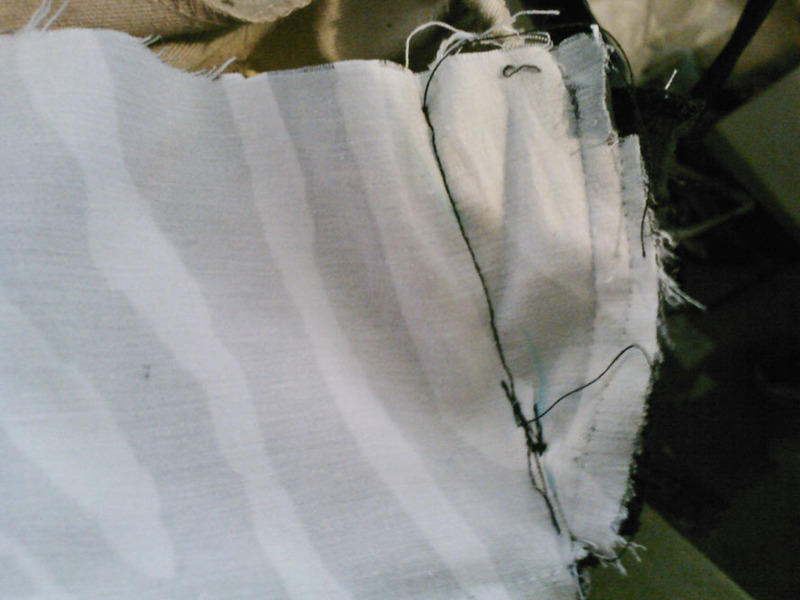 Next, she folded it down all around the waistline about an inch and sewed it up to form a nice casing at the waist. 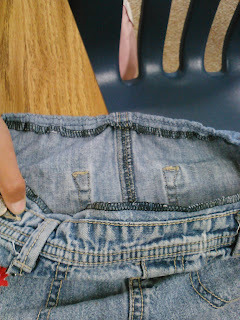 Kitty inserted a piece of half inch elastic in her waist size, which is a huge 19"!!!! And after pulling it through the skirt waistband, she checked to make sure the skirt fit. It was awesome on her and the length was wonderful. An added bonus is she can wear this cute skirt for years. 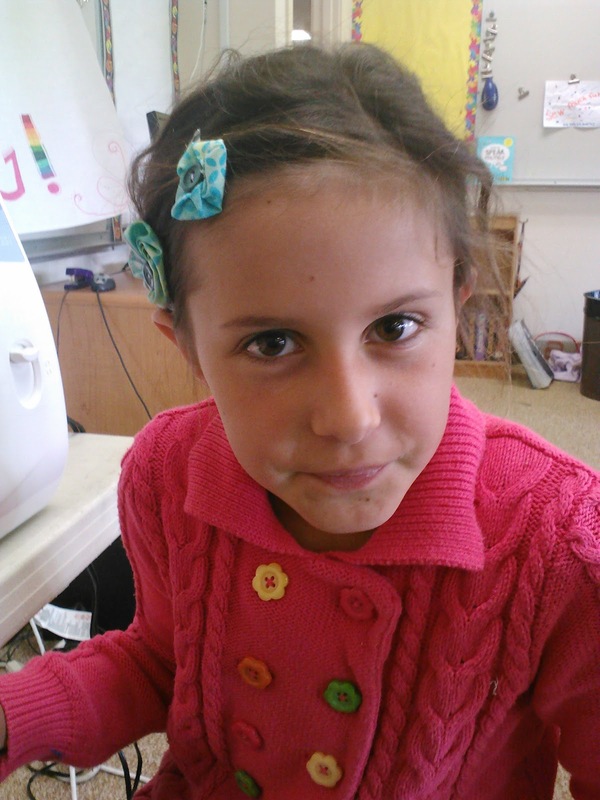 We found some pink ribbon roses and perfect sage green satin ribbon for a bow at the waist. Her cut off elastic waistband became a cute headband with a matching bow and rose. A nice photo taken my Kitty's mom at her home. She put this together with a cute pink jacket to match the roses!! 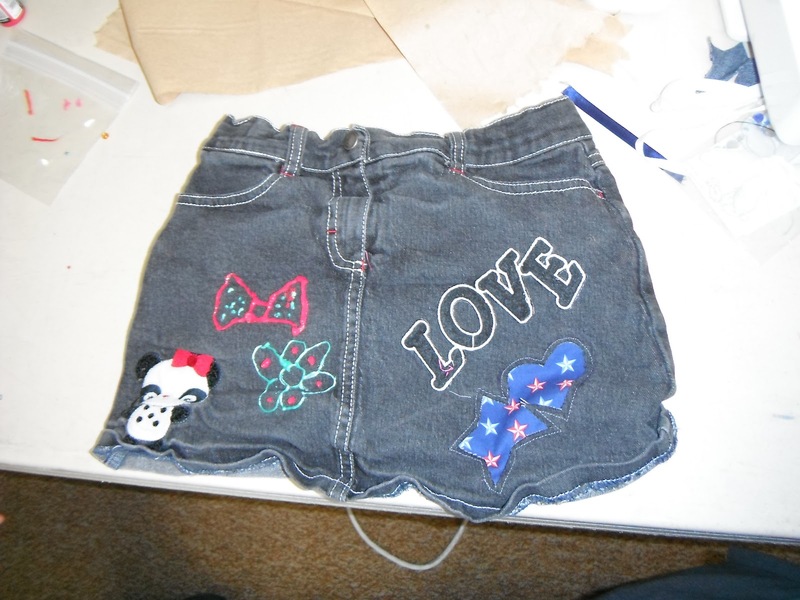 One skirt done in just over an hour, we jogged down the road for a bit of fast food junk for lunch. Audrey joined us and Kitty's mother will never know that she ate half the hamburger but all of the ice cream!! Ha, ha...the joy of borrowing a child for an afternoon is to spoil them a bit. 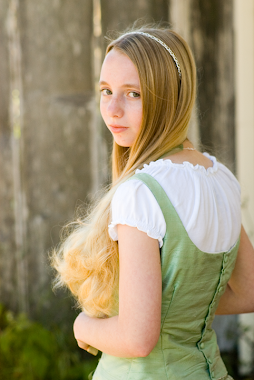 Miss Kitty is a very unspoiled child naturally and it is so much fun to steal her away. We are hoping her mom forgets and we will bleach her hair blonde, name her something new and keep her forever. This is one fun girl to have around. I call this thing a "Pastry Dress". Some poor misguided girl wore this very short and poufy thing to a prom or other dress up event and probably did not realized how badly she needed a longer dress. I shudder at the thought of how it looked with some too high heels, a ton of bling jewelry and gobs of hairspray. Where was the mother when this item was purchased?? AGGHHHH, don't get me started on mother's and what they allow their daughters to wear these days. If I see another toddler in a t-shirt sporting some Rock Star Icon, I might rip it off the child and offer to make something else for her or him for no charge just to see the kids wear actual kids clothes and not little mini sized adult clothes. This was a real Mini Dress. It was only 25" from top to bottom! I am sorry but I find it shocking that any young woman was let out of the house in this creation. 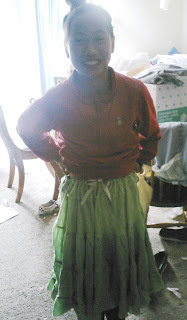 If only she would have come to me and let me create her a flattering and more modest ensemble, she would not have let it ever leave her closet. Anyway...moving on with the "Pastry Dress". 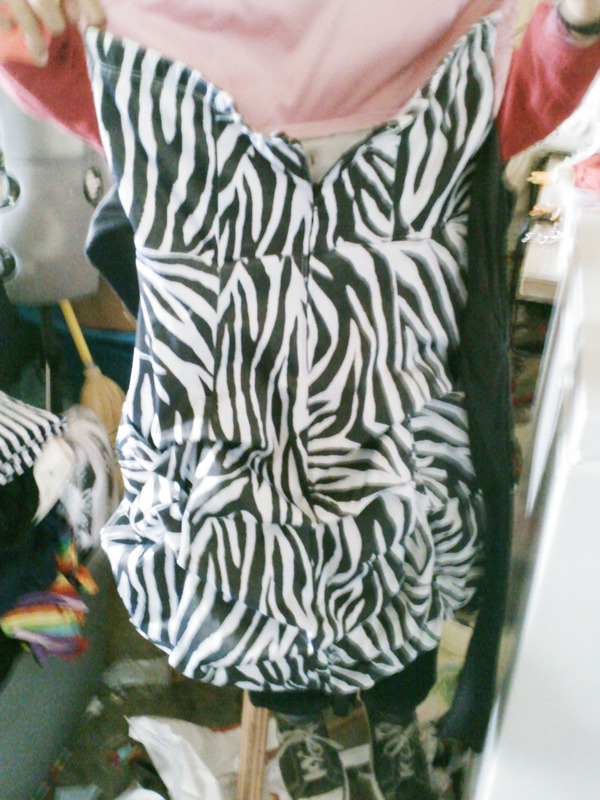 As you can see in the picture, it has a very puffy layered skirt in a zebra print. 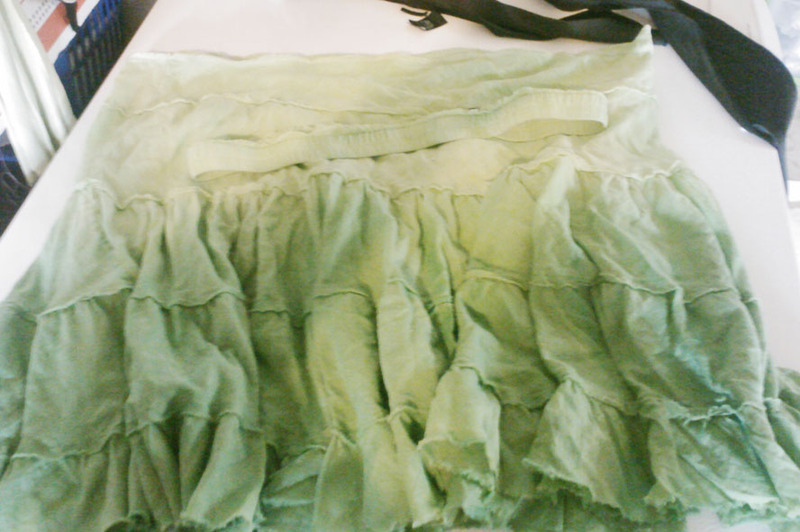 This type of skirt reminds me of a frosted pastry. The top had a pink sequined strapless band that was fully lined with a big thick and kind of gross bra structure but amazingly, not any boning to hold it up. 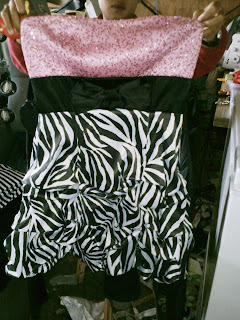 There is also a very cute black bow and sash in the middle. 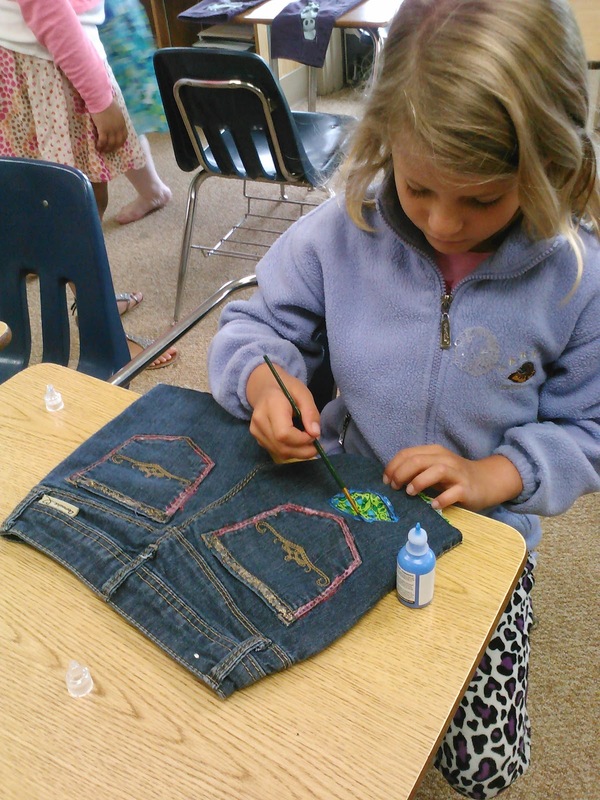 Kitty was hoping this could become a fun skirt for her to wear for dressing up. She was right! The back of the dress had a nice zipper and since it was so darn short, it was not far off being a skirt for Kitty with the exception that it was 9" too wide for her waist. 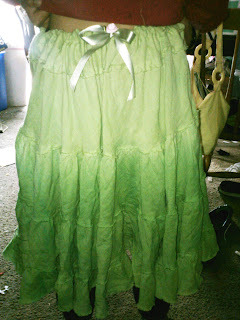 There was also a lovely long sash in back as well as the adorable front waist treatment with a big bow. 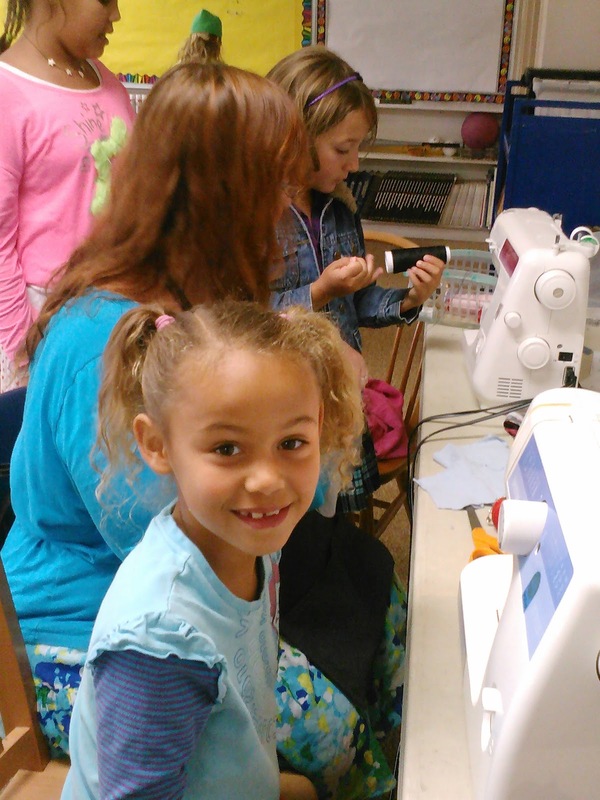 We unstitched the large bow and pinned it safely out of the way while we created a smaller waistband for her adorableness to wear comfortably. 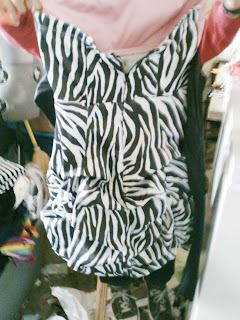 The hideous pink top thing had to be cut off and I was pretty glad to see it go. Sorry, I am not a "pink" person. But I do love the musician by the same name. 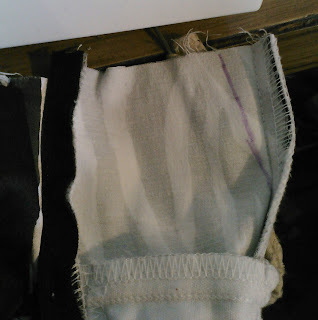 We cut out a black waistband lining from some black cotton batiste. 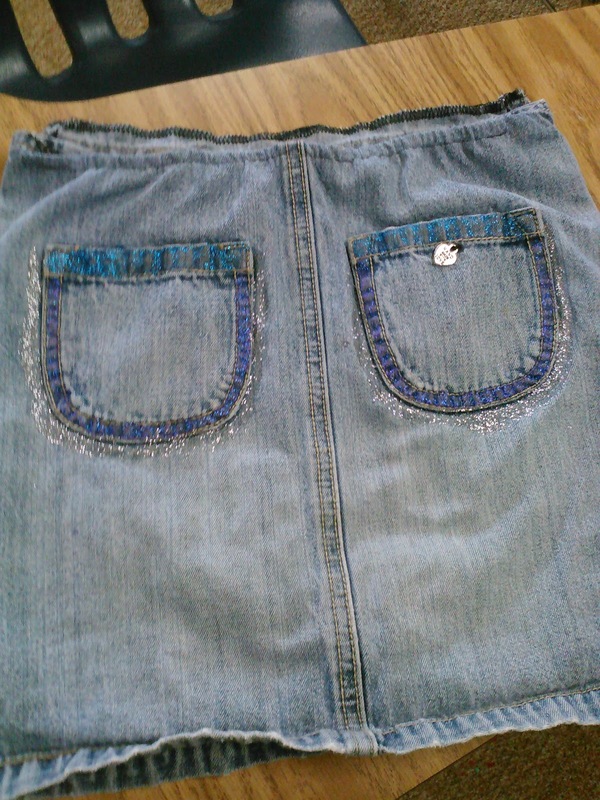 Kitty sewed this along the top and it was hand-stitched inside to form a nice lined waistband. 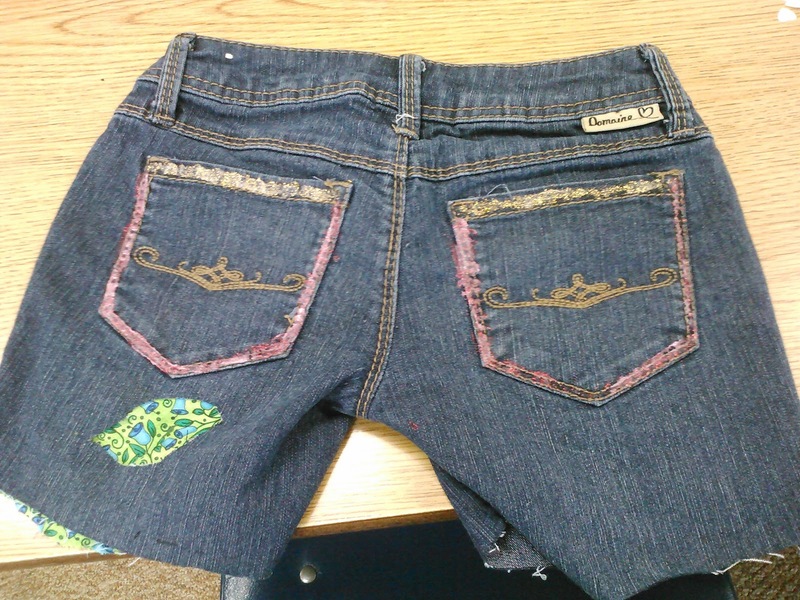 The original zipper was only cut a few inches when removing the pink top. The black side tie sash was re-attached now and the front bow was unpinned and also re-attached. The fit was amazing, Kitty looked just like a little striped cupcake in it! Just kidding,....I did not want to eat her. Just hug her a few times. It was a delight to have her over today. 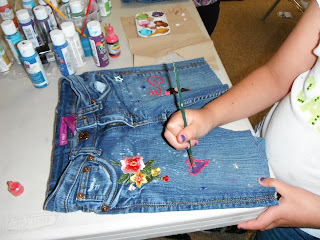 In just about an hour each, both Goodwill finds were created into fun, useful and up-cycled skirts. 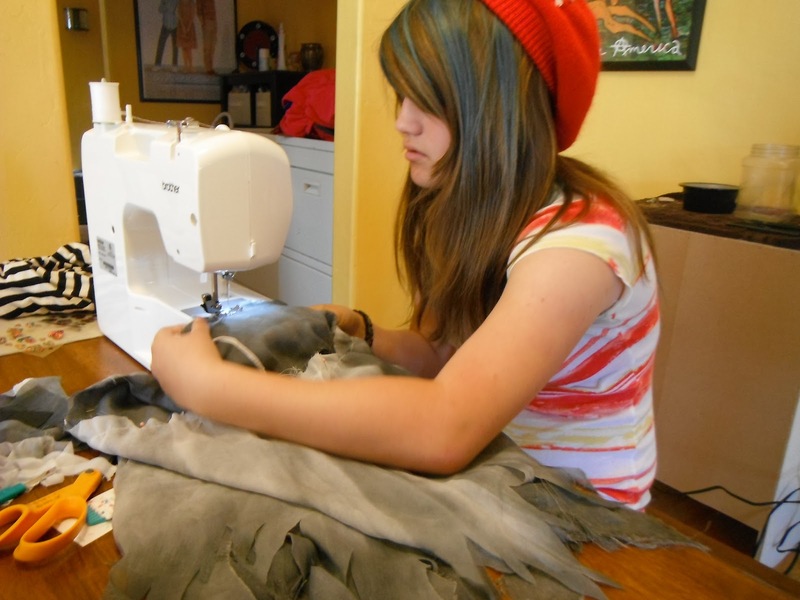 This is Altered Couture at it's best when my young student is able to have so much fun with such nice results.Miss Kitty is just precious in this skirt. Next time you are shopping at Thrift stores, remember that just because it is too large, don't overlook anything. Just finding some great fabrics and figure out something fun to do with them later so they can have a new life in your closet. Most recycling we participate in is considered down-cycling. When you recycle your box, it just gets taken to the dump and smashed but not used for something better. 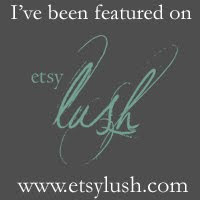 However, when you figure out a way to take an item that is otherwise ordinary and make into something new, different and actually nicer than the original, it is considered upcycling. 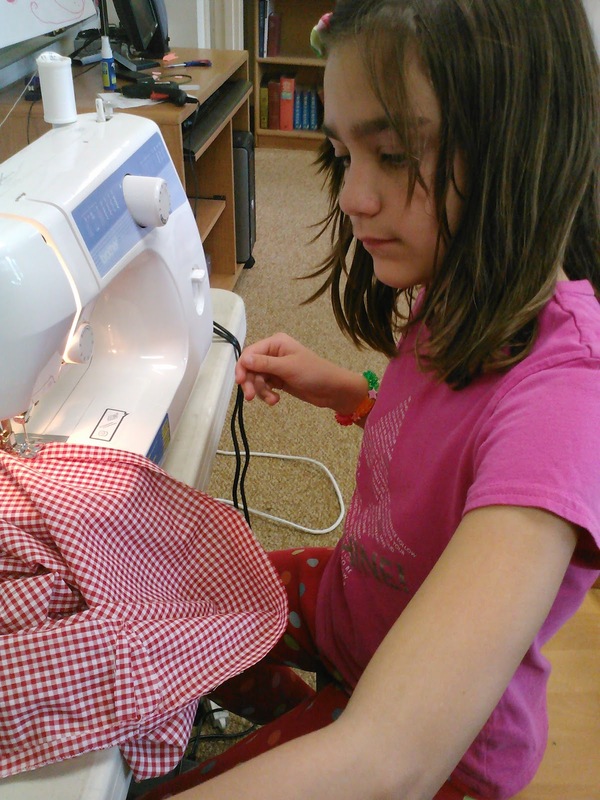 Green to the Seam is about upcycling your old fabric items: curtains, clothes, tablecloths,towels,etc...into something useful for today.